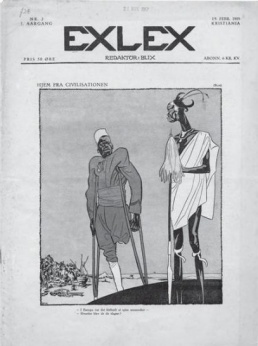 Exlex [Lawless] was a satirical weekly published in 96 issues between February 1919 and December 1920. Started in Oslo, Issue 26 (Aug 1919) and onwards were published in Copenhagen. The second year the magazine used a slogan "The only Scandinavian Magazine for Art and Satire". Its founding editor, illustrator Ragnvald Blix, had had his formative years in Copenhagen, Paris, and Munich (he worked in the satirical weekly Simplicissimus for over ten years), and recruited artists and writers from across Scandinavia in the hope of building a stronger and better Scandinavian community--primarily with the ambition of creating a high-quality satirical magazine. Contributors included illustrators Olaf Gulbransson, Anton Hansen, Adolf Hallman, Ossian Elgström and Robert Storm Petersen, and the poet Herman Wildenvey. Rikke Petersson, "Ragnvald Blix. The Cartoonist Who Challenged Hitler", Baltic Worlds (Mar 2011), pp 22-25. This page was last modified on 18 October 2016, at 20:16.